<Rapala> “<Sub-Ubi> “/msg rapla do the dinosaurs have two sexes, like we do? <DreamWork> Hello all. We have here Seamus, Brady, Paul, and Austin, and we’re very psyched to be here. <DreamWork> The dinosaurs will indeed have two sexes. We’ve worked pretty hard to add differentiation within species. <DreamWork> Bakshra is correct, there. <Cool> rapala, check his pulse..
<DreamWork> We only wanted to show things that we could render extremely well and physically correctly, e.g. like the water. We didn’t have a good way to do fire as well, so it doesn’t go in. We will have muzzle flashes, however. <Rapala> *GiB_WaKeR* have they decided yet if they will release a demo? <Rapala> *Bobby* Is the music in trespasser composed on keyboard/midi? Or will the music feature a real intruments? IE: violins, trumpets, etc… something never seen in video games. <DreamWork> Our music is all orchestral, although it is recorded electronically. It is not MIDI, it streams. We are pretty blown away by it. Also, it plays on triggers, so it is reactive in a lot of situations. <DreamWork> We’re being very careful with ramping up, orienting the player. The basic controls are a lot like Quake, and we add new things slowly, one at a time. So I don’t think players will have too much trouble. <Rapala> <Bakshra> How far can the player “see” before the engine cuts off the view plane? <DreamWork> About a kilometer (.6 miles), when you’re up on a high place. In a few cases, further. <Rapala> *Evilyam* How will the inventory system work? Can you clip stuff to your belt? <DreamWork> Yes, that’s right. If you look down, you can see it (e.g. a pistol) on your hip. <Rapala> *WshMaster* Will the water flow or are there just ponds/lakes? <DreamWork> Will waterfalls do it for you? 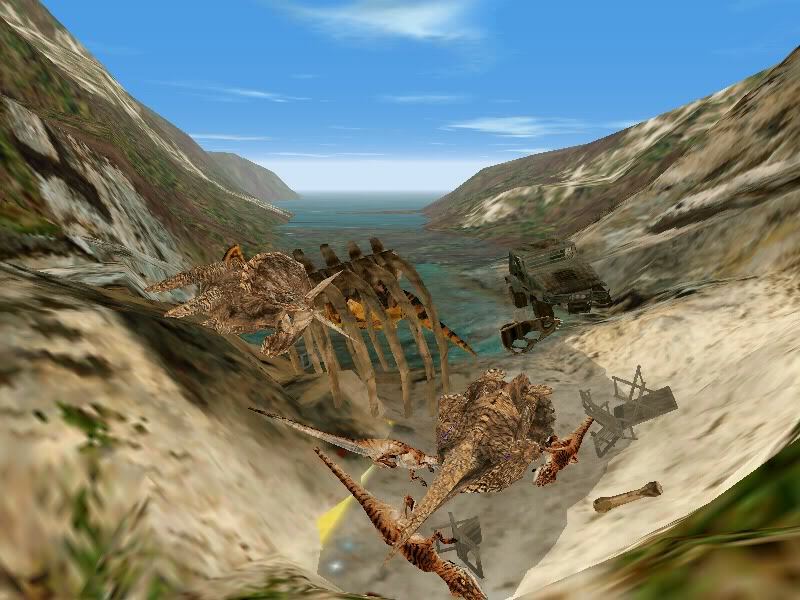 <Rapala> *Mac_Daddy* .. i know trespasser has 3dfx support .. but all the screenshots iv seen are in software… will trespasser have hardware graphics … or just 3dfx with software rendering? <DreamWork> All current major cards will be supported; all graphics will be rendered in hardware except those that are bumpmapped. Currently bumpmapping is not well supported in hardware. <Rapala> <Xynder> how do you think gamers will feel only being able to take a minimal amount of damage? <DreamWork> I think what you want to know is, how does damage work? <Stusser> Is damage region-specific? If you get hurt in the left leg, do you limp around? <DreamWork> No, we figure that would be frustrating. The dinos have hit-location, though. Head-shots are devastatiing, and they pretty much shrug off hits to the tail. <DreamWork> Let me put it this way — you will not wonder where you hit the animal. <Rapala> *Iscariot* Will Trespasser have OGL support? <DreamWork> No. OGL support would be redundant, given that cards supported through OGL are a subset of cards supported through Direct3D. <Rapala> *G* How much benefit will Trespasser recieve from the 3D Now! instruction set? Will it be like the Voodoo 2 Quake 2 3D Now! Mini GL driver, or as good as Unreal, or will it be even greater? <DreamWork> Given the amount of floating point we do versus typical 3D games, we expect great performance gains. We have some routhines that have been hand coded by the designer of the chip. <Cool> are there any Jurassic Park 4×4’s? Like the ones seen in the first movie…if not, are there any operational vehicles? <Rapala> *Linguica* Why in the world are the raptors’ mouths always really wide open in the screenshots? Do they have some sort of reverse lockjaw or is it just a very strange coincidence? <DreamWork> We’d thought you’d want to see the attacks in the screenshots. Perhaps they want a bite of sausage, linguica. <Cool> cause it looks cool..
<Rapala> <Bakshra> Will Trespasser take advantage of MMX technology? <Rapala> <Xynder> what are the specs for a system that will run Trespasser without any hiccups? <Cool> Have you guys tested the game on the Riva TNT? if so, how was the performance? <DreamWork> Yes. Tomorrow we are meeting with the NVidia people, in fact: they are stoked! <Rapala> *_TheDude_* how many raptors in a tribe? <DreamWork> Depends which, actually. The jungle and forest ones are the most populous – 40 or 50. Other tribes inhabit the ruins and the mountainous areas — smaller niches. <Rapala> *Angus* How far in development is Trespasser? Have all the “areas” been completed? <Rapala> *Mattimus* Do dinosaurs start in preset locations ? Do they appear at preset times? <DreamWork> It varies — we’ve laid a few traps for you, but there are also roaming dinos, random factors. It will be different each time. It’s their island — we mostly let them go about their business there. <Rapala> *Sub-Ubi* when you say I can look down and see the gun on my hip, does that mean I can see my feet and everything? <Rapala> *Evilyam* Can you, for example, fill a bucket with water? <DreamWork> No, no pouring water. Good god, we need to ship this someday. Actually, like we said before, we wanted a world in which *every single object* behaved correctly *all the time*. So while you won’t be slowly chipping walls away with a chisel, or chopping down forests, or slowly draining lakes… Good god, you people need to get a life if that sounds fun. <Rapala> <Xynder> are there any moments that make the player jump out of his seat? <DreamWork> I certainly hope so. I always get this creepy feeling when I can hear the dinosaurs moving around near me, but can’t see them. <DreamWork> We support AuReal, SBlive and DirectSound3D. Maybe more. EAX, anyone? Seriously, the sound, sound effects, music, and environmental sounds are going to BLOW YOU AWAY. We were basically stunned when it started working, and we looked at one another like, goodness, this is a lot cooler than we thought it would be. Also, SounDelux, the Movie sound company that we are woring with, has really taken it to the next level. ‘<Rapala> We thank you for being here..
<Stusser> Yeah, I can’t wait for the game!